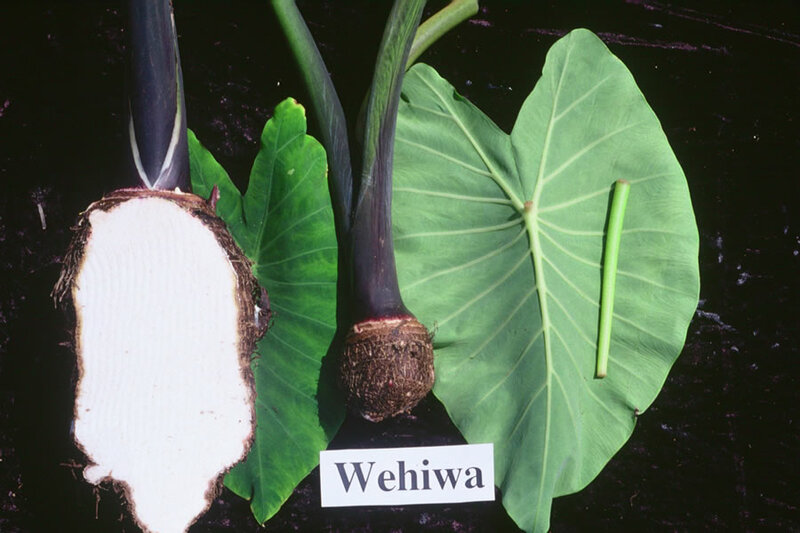 General Characteristics: Medium in height, moderately spreading, maturing within 8 to 12 months, producing from 5 to 10 oha; similar to Apowale except that the flecking and color of base are lighter and the petioles are reddish at point of juncture with the leaf blade. Petiole: 70 to 90 cm. long, dark green with dark purplish tinge on lower portion, flecked near base, light reddish-brown at apex, reddish-brown at edge, a light pink ring at base. Leaf blade: 45 to 55 cm. long, 30 to 40 cm. wide, 35 to 45 cm. from tip to base of sinus, sagittate, somewhat concave, dark green; margins slightly undulate; piko light reddish-purple; lobes acute with narrow sinus. Corm: Flesh white with yellowish fibers; skin light to dark purple, the leaf scars dark purple. Inflorescence: Peduncle dark green with brownish flecking on lower part; spathe 22 to 26 cm. long, the lower tubular portion 3 to 3.5 cm. long, dark green with purple at base, the upper portion yellow; spadix about 10 cm. long, the sterile appendage 8 to 9 mm. long. Distribution: Little-known variety, found only occasionally around Hilo and in Puna, Hawaii, under upland culture. Use: Good for poi as well as for luau. Remarks: Growers state that this variety can be held over in the fields for a considerable period after maturity without serious loss from soft rot.